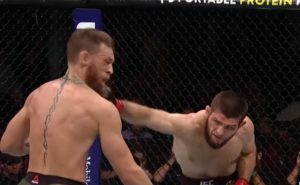 Following Khabib Nurmagomedov’s dominant, submission win over Conor McGregor last month, the UFC champ’s father is reporting his son would face McGregor again…but in a boxing match. “As for the fight against Conor under boxing rules, this is a fight we are interested in,” Abdulmanap said. “Khabib showed that he is able to beat the best strikers of mixed martial arts. He said this before, but few believed it. However, after strong victories over Michael Johnson, Edson Barboza, and Conor, people begin to believe. Nurmagomedov and McGregor are still facing disciplinary action from the Nevada Commission, as a result of the post-fight brawl that occurred at UFC 229.